Hi all! My husband and I were recently adopted by a young husky girl I found in pretty rough shape. Owners registered on chip denied ownership so we brought her into our home and quickly found ourselves head over heels crazy about this little girl. I've been checking out this site for a few months and found a lot of really good information here and so I finally decided to join. We are learning about huskies and their delightful personality quirks, their need to be kept busy, (is this why our yard now resembles Swiss cheese?) as we go, which brings me to this: our husky (Ziva) eats dirt. A lot. I've read that this could be due to mineral deficiency, though we feed her pretty good dog food plus raw meat. Is this something huskies do when they're bored or depressed? Or perhaps should we change the dog food? We buy Fromm's adult (the vet believes she's around 2-3 years old). Thanks for any advice! I wouldn't change the food unless the Vet recommends it - and Science Diet is not a good substitute for Fromm's!! Now, dogs do a lot of things when they get bored, digging is probably the most common when it comes to Huskies (chewing things is common with ALL dogs!) Take a look at this blog entry from PetMD and see how it stacks up. Depending on the company with which the Chip is registered you'll have a problem getting it put into your name. If the 'previous <non>owners' are local to you, you might be able to get them to release her to you. The Chip is proof of ownership so that dogs can't be stolen and resold (among other things) so you can see why the Chip Companies are real reluctant to 'take your word' that you adopted her off the street. If you adopted her from a rescue they might be able to help get the Chip registered in your name. Don't go for another chip, most vets won't do that anyway and it only confuses the ownership question. I was stationed in Japan in the '60s - long after WW II ended but we still had to watch our footing in the public parks because of old bomb craters. Some yards I've seen look a lot more like the results of 'carpet bombing runs' than anything else. You might want to make her a sand box and direct her digging there rather than the yard. Z'ev eats dirt, too. He's on a good food. He's very specific about the exact dirt he eats, I think he smells something tasty - he'll be walking along, stop as if something called to him, sniff, scratch a bit then lie down and nibble on the dirt. Now THAT is an impressive hole! We are proud owners of a 4 month old female named Piper. We are new husky owners. I have raised labs my whole life and this experience is very new to me. Wow, what a difference in breed, not negative, just different. Piper ingests soft items in a second. Like she doesn't chew them, she swallows them in a moments time. She actually does this with any soft, cloth like item. We are very careful to avoid making these items available to her, but with two teenagers, we slip up at times. Thank god, she has either vomited them up (whole) or passed them so far. Is this a husky thing or is this just a Piper thing? Thanks for all of your responses. 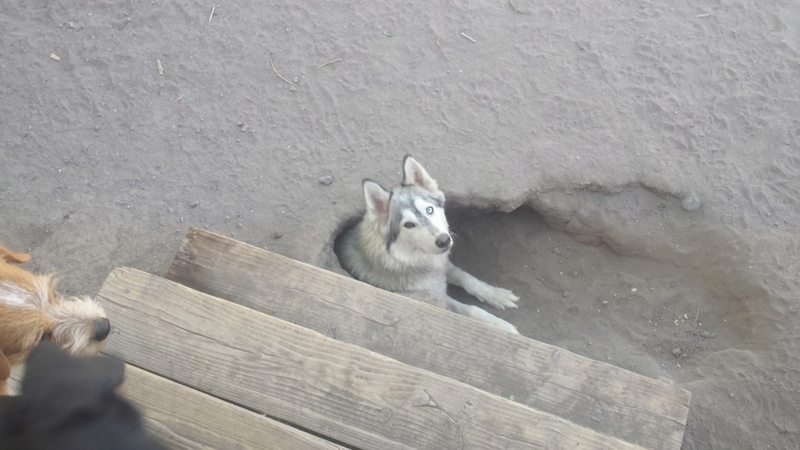 I won't stress a whole lot over the dirt eating thing, and I like the idea of teaching her appropriate places to dig...huskies are stubborn, though, we're finding! Btw Lostmaniac, that is a fantastic tunnel!!! Congrats on being adopted by a husky! They can be pretty picky, so you must be nice humans! I read an interesting thread from the German Shepherd forum where somebody's shepherd seemed obsessed with eating dirt. A forum member recommended sprinkling their dogfood with something like "homeostatic soil organisms" which is available in Whole Foods, and apparently it worked!! After a week of sprinkling, their dog stopped eating dirt. @Lostmaniac, that is amazing and LOL...600 ft of tunnel, 6 dogs...I know my dog is jealous just hearing about it!! and another tasting is just before the last corner on our walk.